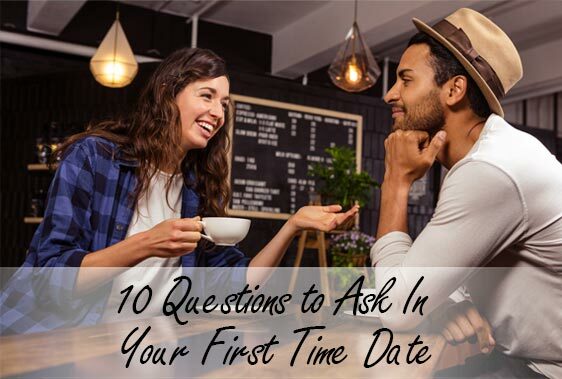 Questions to Ask In Your First Time Date.First time meetings can be a little daunting here are questions to ask in your first date and feel confident. 1. Who matters the most to you in your life? You will want to pay attention to the answer given after asking this question. That is because you can find out how they value relationships in general. If they answer with my parents or my kids (if they have any), then that is a good sign that they will value the relationship with you as well if it turns into something lifelong! If your date can answer this question easily, then that is a good sign that your date has a great sense of humor! Even if the humor seems somewhat offbeat to you, that is okay. At least the date was able to answer the question instead of shrugging or saying I don’t know. 3. What are your weekends like? This question is an important one to ask your date because if your date answers that they have to be at the office or if they spend all weekend cleaning, then you will have to know right there that they will not likely have time to put effort into a relationship. If their weekends are free even if they have to work some shift work, then that is a good sign. 4. What is your biggest passion? You will want to make sure that your date has an answer to this regardless of what the passion may be (unless it is something sinister then you will want to run). But if the answer is the place of worship, traveling, art or something, then that tells you about their value system. If the answer is I don’t know, then that is not a good sign there. You will not want to hook up with someone that has no passions at all. 5. What is your favorite place to visit? When you are looking for your mate on our Indian matrimonial site, this is definitely an important question to ask. The reason is that if you find out that your date loves going to a certain coffee shop, the library, or any restaurant, you can get a good idea of the tastes that your potential partner has. 6. What was the best meal you had ever had? You can ask your date about their favorite food, but if you ask a specific question, then you will get an elaborate answer. This is good to ask because asking specific questions like this will also make your date realize that you do care to hear about their experiences in detail. This shows them that you are interested in them genuinely. This another way to learn about what your date is the most passionate about. And, it does not matter what the answer is (as long as it is nothing sinister of course). As long as there is a good answer of some sort, then your date most definitely has interests. 8. What is the perfect burger composed of? Again, this is another question to ask that allows your date to speak in detail and it shows them that you genuinely care about knowing them well. Additionally, you can learn how adventurous their palates are. 9. What is the most difficult thing you have ever done? You are not trying to into your date’s past heartaches and failures by asking this question. You are giving your date the opportunity to share a struggle that they are willing to talk about. This can also give you an idea of how resilient your date really is. 10. What possession is the most valuable to you? his will help you realize what your date’s pursuits, passions, and priorities are. If your date without any hesitation says that the most valuable possession is a highly expensive item or several expensive items, then you will have a good idea right there that this individual has very high standards and may care more about expensive items than anything else. When you are on our Shadi Indian matrimonial site to look for your potential match, now you know what questions to ask when you go on your first date with your possible life partner.